The latest volume in the Temporary Conversations series, published by Temporary Services, features Aaron Hughes being interviewed by Milwaukee/Chicago based artist Nicolas Lampert. Hughes, now an activist and artist living in Chicago, joined the National Guard straight out of high school in 2000 expecting to "serve my community and sandbag the Mississippi." He ended up being activated and sent to Kuwait where he worked in a unit transporting supplies to and from Iraq. Disillusionment set in and Hughes turned to art. He tells Lampert that after being deployed "it got to the point where I couldn't believe in anything. I couldn't believe in my country. I couldn't believe in religion. I couldn't believe in the education I had been raised with. All of these institutions that had brought me up had crumbled except for one thing, and that was art, the idea that humanity can be shared through these creative gestures." At first intending to take a series of photographs to document his experiences as soldier, Hughes had to improvise after his camera was quickly ruined by sand. Switching to a cheap disposable camera, the pictures taken in Iraq and Kuwait served as reference material for later painted reproductions. 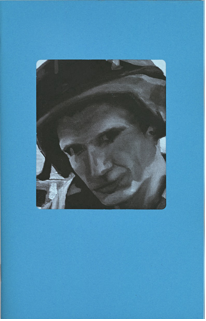 Lampert and Hughes discuss a few pieces from Tourist Photographs from Iraq a "series of four foot by four foot oil self-portraits from photographs [taken] while serving in Iraq." Particularly enlightening is the discussion of "I remember standing there", a portrait of Hughes and another soldier posing with bravado in front of the tangled wreckage of a Humvee in which three people had just been killed. It's in the discussion of these activities, as well as in talk of the inner workings of the IVAW that Lampert is best able to use his experience as an activist, artist, and organizer to bring out the often overlooked experiences of veterans attempting to engage the disinterested public with the realities of warfare in the twenty-first century. 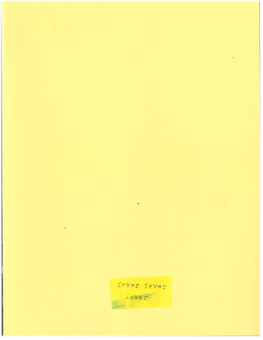 Artist and Small Space co-owner/curator Sara Caron released a small chapbook this fall that combines minimalist poetry, illustrated words, and xeroxed photo manipulations. Many of the poems in fever fever fever experiment with words by breaking them down syllable by syllable to arrive at new words or phrases. The most frequently manipulated word is, not surprisingly, 'fever,' which through repetition and syllabic breakdown transforms into a series of provocative new words. Juxtaposed with the poems are en face workings of a single photograph of, it appears, a woman in plaid from at least a few decades past, reaching for something unseen, perhaps in a garden. The photograph is variously blurred, stretched, duplicated, and darkened into near unrecognizably. If the first impulse is to take these reproductions as images from a fevered dream, the repetition of subsequent viewings, as well as pairings with words like those above, evoke a haunting feeling of familial loss or the remembrance of a time to which a return is impossible. There are also playful moments in fever fever fever, such as Caron's freehand cursive renderings of the words 'easy' and 'silk' that loop and encapsulate themselves in a web of decorative swirls and flourishes. In the books final poem, the word fever is again approached in a series of reworkings that show the word losing meaning and becoming simply a series of sounds. The sound-based playfulness here is engrossing and works to a completely different effect when presented alone as compared with the visual aspects of fever fever fever. They both, though, show a writer discovering and widening her style into something we'll hopefully see more of in the near future.